In the west portion of the work zone, contractors for the City of Fargo’s 19th Avenue North road reconstruction and infrastructure improvement project have wrapped up the roadway construction for this year. Travel between the new 45th Street North intersection to 57th Street North intersections on 19th Avenue North is all open to motorists. Crews working from the east edge of the Horse Park to just east of the 57th Street and 19th Avenue North intersection have temporarily removed detour routes or temporary business access along 19th Avenue North over the winter. Access to businesses of Mid America Steel, L2 Contracting and the Horse Park/NDSU Equine Center is by way of the new 19th Avenue North road realignment west of 45th Street North intersection. As a reminder, eastbound and westbound 19th Avenue North traffic has the right-of-away at 45th Street North intersection. A two-way stop controls north and south traffic coming from Interstate 29 (I-29). The new 45th Street North intersection moved to the north with the new road alignment of 19th Avenue North and was completed in September. The existing intersection has been removed and railroad crossing has been updated. 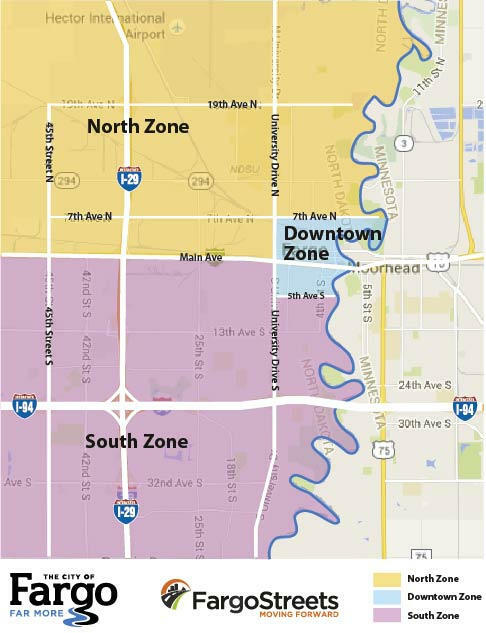 Two adjacent projects were designed to build an urbanized 19th Avenue North roadway section from I-29 to 45th Street North, including 45th Street North intersection reconstruction from 16th Avenue North to 19th Avenue North, and from west of 45th Street North to 57th Street North. The project work was slated to be complete over two-years to accommodate increased traffic volumes and anticipated population growth in north Fargo. In July, the east portion of the new 19th Avenue North roadway alignment opened with the east portion completed in fall 2017. The completion of the two projects has taken longer than originally anticipated. The remaining half mile of roadway reconstruction and underground utility in the west portion will be complete next year. 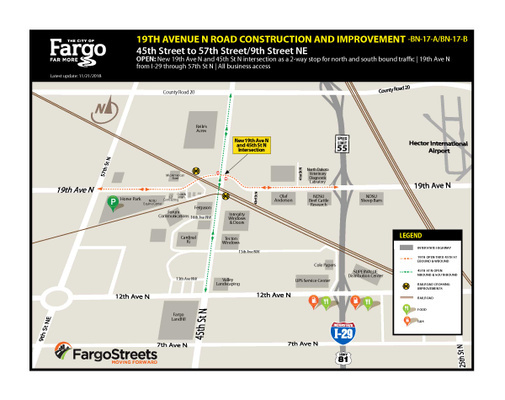 During the 2019 construction season road closures and temporary business access from 19th Avenue North will be needed to complete the improvement project in the summer.